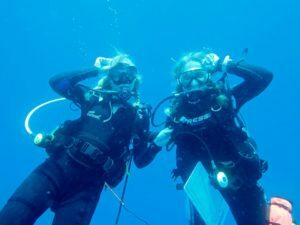 Advanced volunteer divers Summer Newton and Nikki Chapman strike a pose after spotting a couple of shark species including the endangered scalloped hammerhead shark. 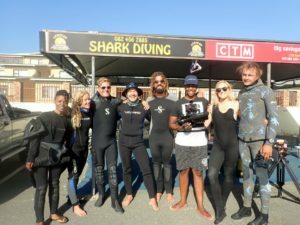 A team of dedicated volunteer advanced divers embarked on a citizen science project over December and January at Protea Banks (KwaZulu-Natal South Coast), in the hopes of gathering valuable data linked to the endangered scalloped hammerhead shark. The project, an initiative of WILDOCEANS a leading NGO, set out to count a reported aggregation of scalloped hammerhead sharks in the recently approved Protea Banks Marine Protected Area to better understand the population numbers, their movements and the importance of the area for their protection. The activities were filmed and are set to feature a marine documentary series called ‘Our Oceans’ by WILDOCEANS, which is being produced by Off the Fence, a world class production company. The ‘Our Oceans’ marine documentary series will profile marine expeditions aboard the conservation research vessel RV Angra Pequena, raising awareness and knowledge about KwaZulu-Natal’s spectacular marine ecosystems, charismatic animals and the learning journey of the scientists and Ocean Stewards on-board the vessel, as well as offer insights from communities along the coastline. The Protea Banks shark count team and film crew (left to right) Zamo Phungula, Nikki Chapman, Roland Mauz, Dave Moldenhauer, George Kirkinis, Moses Tau, Summer Newton and Martin Jansen van Vuuren at Shelly Beach on the South Coast of KwaZulu Natal. Mauz who has dived Protea Banks since 1996 says shark species have changed their arrival and departure times and it could be due to climate change. “We have more wind than ever before. Some species have been reduced in numbers and other species have increased. I cannot explain why that is, but it seems to coincide with rising temperatures, pollution and over fishing. For example, we have more hammerheads than when I started diving in 1996 and can assume that they are running from hammerhead hotspots like the Galapagos, Cocos and Malpelo where they are decimated by fishermen for their fins. We also have less tiger-sharks than ever before. Unfortunately, it is difficult to say “why” because we don’t have comparable data”, he said. George Kirkinis Assistant Producer at Off The Fence and underwater camera operator for the count said people should be excited about seeing the film because this is a proudly South African story. 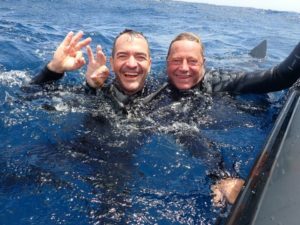 Members of the volunteer dives including Dave Moldenhauer and Roland Mauz in great spirits after a successful shark count dive. “It’s a film about our oceans and our legacy and our inheritance at the same time. We are custodians of the ocean space and this film highlights what we’re doing right and what we’re doing wrong as custodians of the ocean. The global significance of this is that this is a human trend, we are all responsible both for the oceans’ success and the oceans downfall. These films are dialogues around the space we hold as humans for the natural world”, said Kirkinis. Zamo Phungula onboard data-capturer for the expedition said every dive produced unique and valuable information and that the dots began to connect as more dives were done. “The divers went down to depths of over 30m in wind speeds that averaged 18 knots and swells reaching over 2.5m. It was evident by the distance drifted by the divers that the currents were very strong. It was interesting to see how temperature also played a role on where and when the hammerhead sharks appeared”, she said.